As a wardrobe stylist on the speaking circuit, educating companies on the Do's and Don'ts of proper workplace attire, I admit I am not a fan of the move toward Business Casual, or, as this article more accurately phrases it, "Business Whatever." That said, the dressing-down trend has been great for business (MY business, that is) because...for many people, when you give ‘em an inch they'll take a mile. Whereas professional dress code rules are relatively clear cut, there’s a lot of grey area under the umbrella term, "Business Casual," and that's how you end up with employees wearing sweatshirts and flip-flops to the office...and thus the need to bring in someone like me to get them back on track. This article from The Hustle offers explanation on how the pendulum swung so far. Do you know which tech company coined the first "Casual Friday?" Or which jeans manufacturer created the first "Guide to Business Causal" for the sole purpose of pushing a low-sales product? Read via link to left on to find out. In addition to helping guests shop, I did a little for myself - picking up these Diane gold statement earrings in abalone shell. I was thrilled by the invitation from Kendra Scott at The Summit to be a Guest Stylist at their recent VIP event. Who doesn't love playing in someone else's jewelry box?! In addition to helping guests find just the right pieces to add to their wardrobes, I gave a brief talk, sharing a few accessorizing tips. Clients often ask me, “What can I add to my wardrobe this season to keep it fresh and on-trend?” This Spring/Summer, that something happens to be an accessory! The Statement Earring is hotter than ever, especially those including tassels, raffia and/or acrylic. 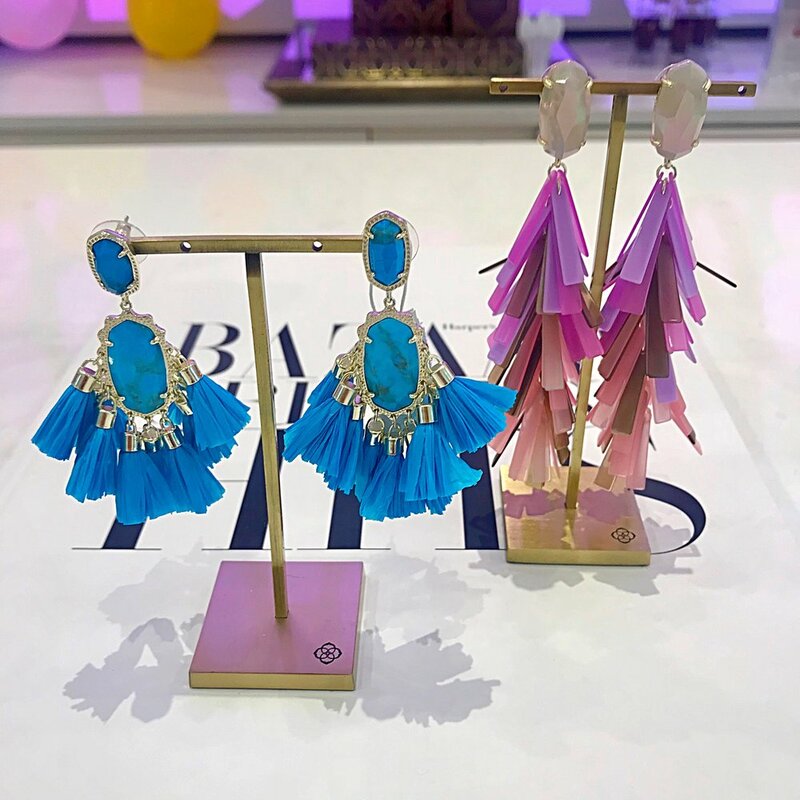 Whether in vibrant color (my personal fave) or pretty pastel, when it comes to statement jewelry, keep in mind that bigger is better. 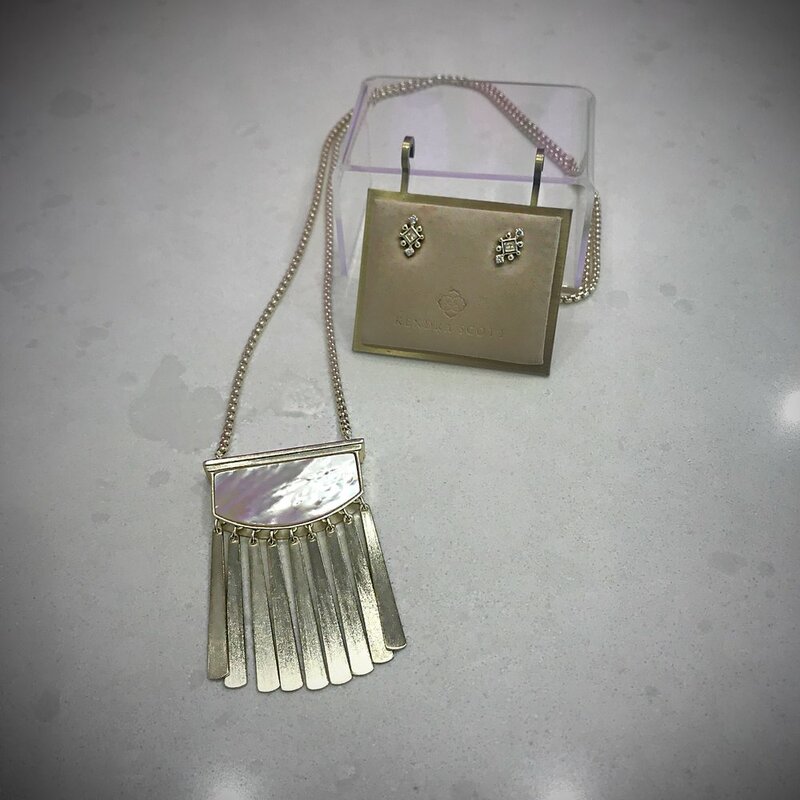 The beauty of a bold piece is that it can be a standalone accessory, making for easy dressing! Not feeling something colorful? Then consider a larger earring in classic metallic - perfect with a pretty neckline that shouldn’t be disturbed with a necklace, but that still needs accessorizing. Actually, the proportions of statement earrings can be quite face flattering. Want to wear gold and silver jewelry pieces together? Then have at least one item that includes both metals, like my favorite druzy studs (below right) or Kendra Scott’s signature cuff. Don’t overload yourself with large pieces, this will only diminish their impact, not to mention overwhelm you. I like to have “breathing space” between my statement pieces. For example, if I am going to wear a statement necklace, then all that is needed is a simple stud. If I want to wear an additional piece with statement earrings, I might skip a necklace (hello, breathing space) but wear a cuff bracelet. On left, silver set: OLIVE LONG NECKLACE IN BRIGHT SILVER, RO LONG PENDANT NECKLACE IN SILVER, and VAL SILVER HOOP EARRINGS IN IRIDESCENT CRYSTAL. On right, gold set: GOLDIE GOLD CHOKER NECKLACE IN GOLD FILIGREE, BELLA LONG NECKLACE IN GOLD, and VAL GOLD HOOP EARRINGS IN IRIDESCENT CRYSTAL. 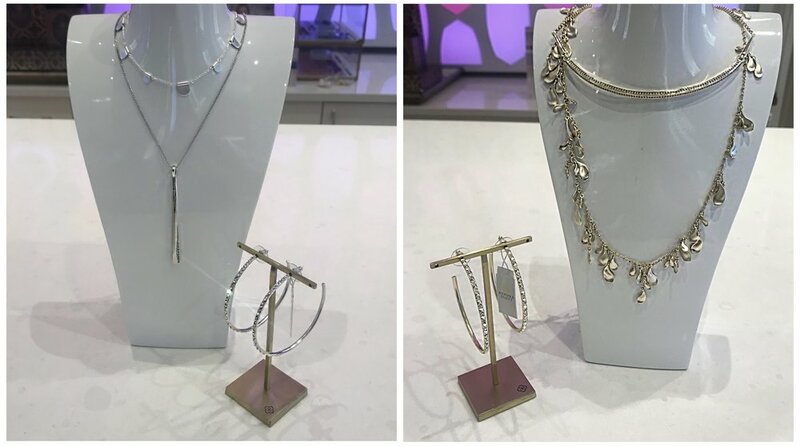 In this stylist’s opinion, everyone should have in their wardrobe both silver and gold necklaces and earrings. The pieces in each set do not need to match, in fact my personal preference is that they coordinate, but do not match. I recommend both a short and long necklace in each metal - or else one that is long enough to double. My guideline for how to choose a necklace: short over skin, long over cloth. But in many cases, like with a scoop neck, you can wear both at the same time, creating a contemporary layered look. As for the earrings, a delicate hoop is ideal - this ever-versatile shape is large enough to offer visual balance, but thin enough to avoid too much visual weight. Embellished sneakers - whether emblazoned with kitschy patches or lush florals - are trending this Spring. Check out these luxury versions and their more budget-friendly alternatives. Check out the pieces from this new floral collection by Phillip Lim 3.1 - ready to carry you from now through Spring. Having grown weary of the monopoly that skinny jeans have held on the denim world, I was relived when an alternate style - flare - rose to the surface. That said, as a petite person I eschewed the style, remembering my experience with bootcut jeans: once hemmed, my bootcut became a straight silhouette. I figured flares would end up as bootcut once altered, so resigned myself to admire the style on others but not in my own closet. Until, that is, I observed a not-so-tall client try on a high-waisted pair and "voila," her short legs were transformed to long. lean stalks, and more exciting, the flare shape remained even after I folded under the hems to mimic the necessary tailoring. Soon after, 3 pair of high-waisted flares (in low/moderate/high price points: Just Black olive/ Paige "Bell Canyon" blue/Free People black) entered my life, opening up a myriad of new outfit combinations, since I was now able to wear my shorter tops with denim, tops that were ill-proportioned for my skinny jeans. Chic Tip: Wondering where the hem of your flares should fall? This style is designed to make your legs took as long as possible, thus should be left as long as possible. Take a look online at celebs and fashionistas sporting the look, and you will see that they practically sweep the ground. If you're petite like me, this means wearing your tallest heels to the alterations shop when having them measured. 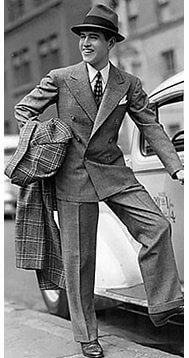 If you're tall, seek out styles with the longest inseam, then select your shoes accordingly. Most likely you will find that a chunkier shoe - like a substantial wedge or platform bootie, is going to best balance the dramatic proportions of the flare. Powerful in the world of design, their seasonal hue forecasts are key for every company who designs physical products, from fashion designers and cosmetic companies to car manufacturers and graphic designers. In fact, Pantone has a hand in the color of roughly half of all garments sold in the U.S., according to NPD, a market research group. Pantone makes three major color announcements every year: The Color of the Year (between fall and December), Spring Fashion Report (around September), and Fall Fashion Report (around February). These color forecast announcements are purposely made well in advance so they can be used to create for the seasons in question. John Crocco, creative director at Perry Ellis, says that if designers choose to follow the color forecasts, they will be a “part of what ultimately becomes the trend.” But when designers overlook or flat out ignore trends as they relate to design, they will eventually become irrelevant. This year, Pantone describes their fall palette as “…a unity of strength, confidence, and complexity. The desire for tranquility, strength, and optimism have inspired a palette that is led by the blue family. Along with anchoring earth tones, exuberant pops of vibrant colors also appear throughout the collections. Transcending gender, these unexpectedly vivacious colors in our Fall 2016 palette act as playful but structured departures from your more typical fall shades. Blue skies represent constancy as they are always above us. Grays give a feeling of stability, Red tones invite confidence and warmth, while the hot Pinkish Purples and Spicy Mustard Yellows suggest a touch of the exotic.” A perusal of Birmingham stores makes evident Pantone’s influence, as pictured this month.